Echo Arena Liverpool holds a variety of events including concerts, comedy and sport. 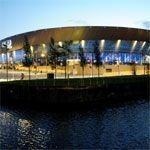 Do you work at Echo Arena Liverpool? What did you think of Echo Arena Liverpool?